Some of Greenland’s islands were discovered sometime during the 10th century by an Icelandic Viking by the name Gunnbjörn Ulfsson and his crew, who were blown off course from Norway to Iceland. His life, deeds, and this voyage are briefly documented in the Icelandic saga ‘Landnámabók’ (‘The Book of the Settlements’ in translation). These islands are called ‘Gunnbjörn’s skerries’, which, according to the tale of Ulfsson, were lying close between Iceland and Greenland. However, he had only spotted them, and did not approach to land or to colonise the area. Eventually, it is quite debatable whether or not these skerries existed, with contemporary historians claiming they were actually Arctic mirages. If they did exist however, it’s very likely that they represented important stopovers for Norse convoys travelling from Iceland to Greenland. If so, then the idea of a proper attempt of settling these territories does not seem such far-fetched after all. This can be sustained by the fact that another Icelandic Viking by the name Snæbjörn Galti sailed on purpose to these remote territories in circa 978, in the wake of Ulfsson’s compromised expedition. Nonetheless, he failed to establish a permanent settlement in Greenland given the fact that his quest met with an unfortunate end, as his comrades started to distrust him at some point, ultimately putting an end to his life following a skirmish on the crew’s ship. There was also an Icelandic saga detailing the expedition but, unfortunately, it was lost in time. One thing remains for certain about this remote archipelago though: it was only several centuries later, namely in the year 1391, that a successful attempt to settle the region was achieved, with 18 farmsteads built in the process. Yet, the first Norse explorer who is credited for colonising Greenland is Erik the Red, another Icelander. Following the failed voyages of both Ulfsson and Galti, Eiríkr Þorvaldsson (who was exiled from Iceland for murder) was the first Norseman to set foot on Greenlandic soil and establish a settlement in the southern part of the isle during the 980s. This successful expedition is documented in two distinct Icelandic medieval manuscripts, specifically Íslendingabók (i.e. ‘The Book of the Icelanders’) and ‘Eiríks saga rauða’ (i.e. ‘The Saga of Erik the Red’). Both claim that Erik the Red is actually the one who named Greenland, giving it this name in order to attract more Norse colonists. After scouting the southern coast of Greenland and claiming parts of it, he returned to Iceland in order to encourage other prospective settlers to join him. According to the Icelandic sagas, in circa 985 Erik sailed with a convoy of 25 vessels from Iceland to Greenland, but only 14 of them arrived to the final destination. After landing with the surviving crew members, Erik built an estate consisting of a church and a longhouse which was known as ‘Brattahlíð’ (meaning ‘the steep slope’), where he and his descendants lived up until the mid 15th century. Today, a reconstruction of this estate is located in the Qassiarsuk village, Kujalleq municipality, southern Greenland. The subsequent waves of Norse colonists gradually inhabited two main hospitable regions of Greenland that are known as Eystribyggð (meaning ‘Eastern Settlement’ in Old Norse) and Vestribyggð (meaning ‘Western Settlement’ in Old Norse). The combined population of these settlements ranged between 2,000 to 10,000 permanent residents, according to different estimations in the passing of time. An estimated amount of 620 farms dating from the Viking Age were discovered in Greenland, of which 520 could have once been found in the Eastern Settlement and 95 in the Western Settlement. 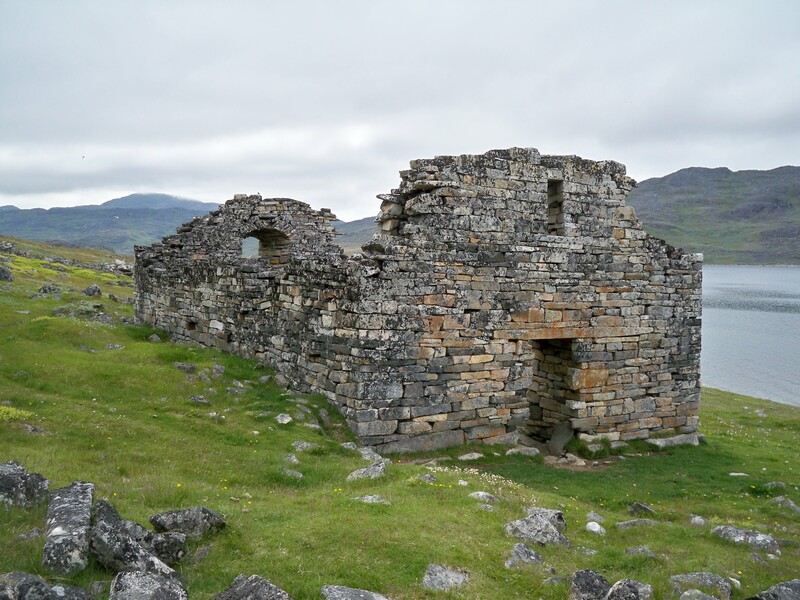 The ruins of the Hvalsey church from southern Greenland, however, represent the best preserved historical evidence of a past Norse settlement in the region during the Middle Ages. Geographically, the site on which the church was built is located on a narrow strip of land facing a fjord, in the proximity of the small town of Qaqortoq (formely known as Julianehåb), pertaining to the Kujalleq municipality, southern Greenland. Many theories have been actually put forth in order to explain what exactly caused the extinction of the Norsemen from Greenland (one theory, for instance, asserts that they might have not been spurred by warm climate to set foot on Greenlandic soil). The documentary below was made in the purpose of finding plausible answers to this enigma.